This recipe was originally published on SouthernPlate in 2008. I updated the photos and instructions in 2018. I hope you get to make this wonderful old fashioned pie soon! The first time I remember hearing of a chess pie was as a little girl at my grandmother’s house. There was this pie on their dining room table and my grandparents and their friends had practically swarmed it until there was only a tiny piece left. Fortunately, that piece went to me. A thick, custardy textured pie, chess pie has long been associated with southern cuisine. No one quite agrees on the actual origins of the name except for the fact that it has absolutely nothing to do with the game of chess (We’ve always been more checkers type folks down here anyway). 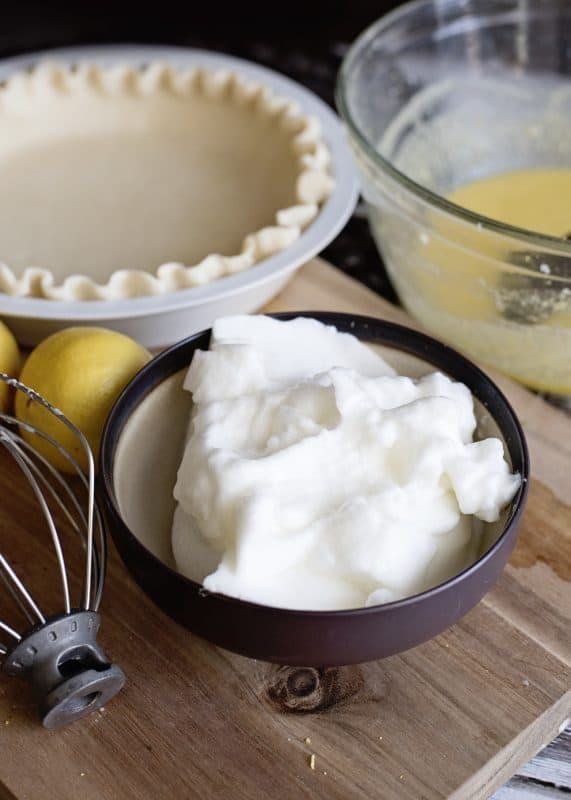 One theory is that since this pie kept so well in a common piece of furniture known as a pie safe or pie chest, they simply named it after that (we do have a tendency to drop our T’s – gotta love the drawl!). 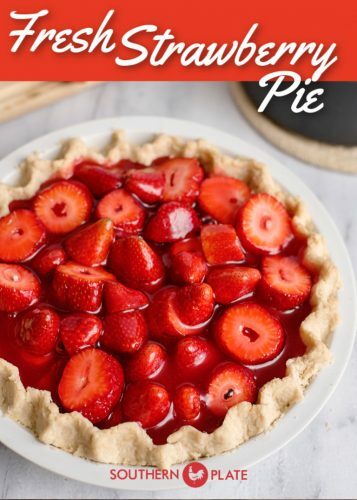 Another theory is around the time the pie was invented, it did not have a name and when the cook was asked what kind it was, she simply replied “Its ‘ches pie” (which is southern for “It’s just pie”). Either way, chess pie is just a good old fashioned dessert. 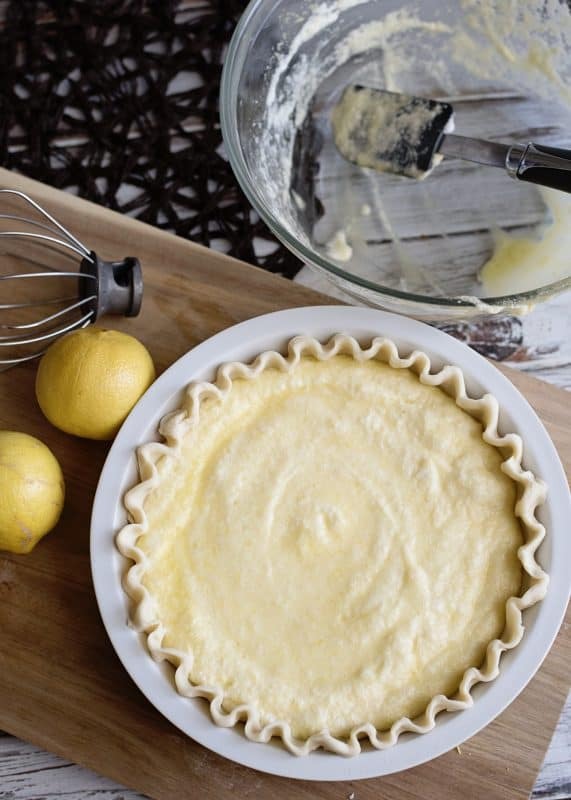 Lemon chess pie is my personal favorite. 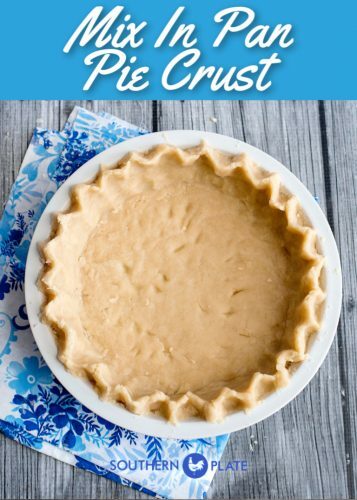 I like to make it with my mix in the pan pie crust for a total old fashioned, simple but good experience but it works beautifully in a standard store bought pie crust, as you’ll see in this tutorial. Lets hear it for simplicity! All you need to make this is is butter, eggs, lemons, and sugar! I have used lemon juice on occasion when I didn’t want to fuss with lemons or didn’t have them on hand and it was still wonderful. The actual recipe is at the bottom of this post in a printable recipe card, as always. Begin by separating your eggs, yolks from whites. Make sure there is no yolk at all in your white because we are going to beat those and they won’t do what we want them to do if they have yolk in them. Cream sugar with butter with an electric mixer until light and fluffy. Beat in egg yolks. 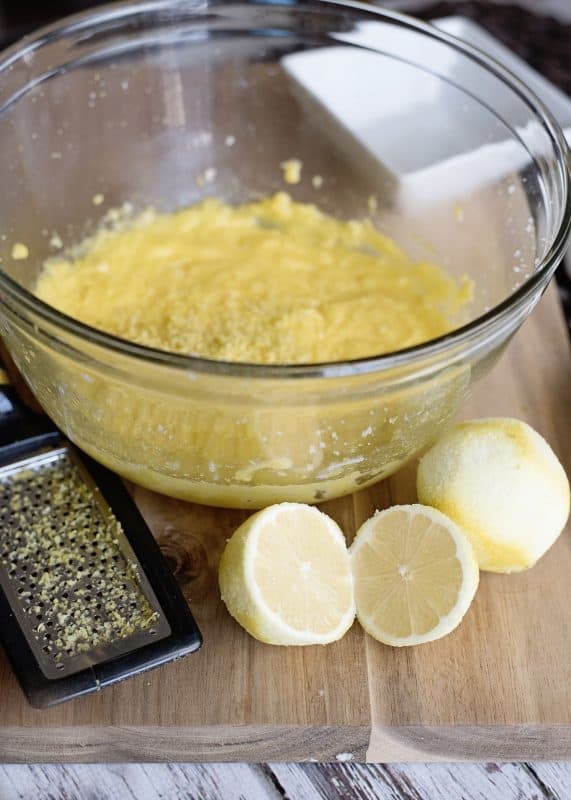 Lightly grate the rinds of your lemon to get some zest. Add grated lemon rind and juice, beat in. 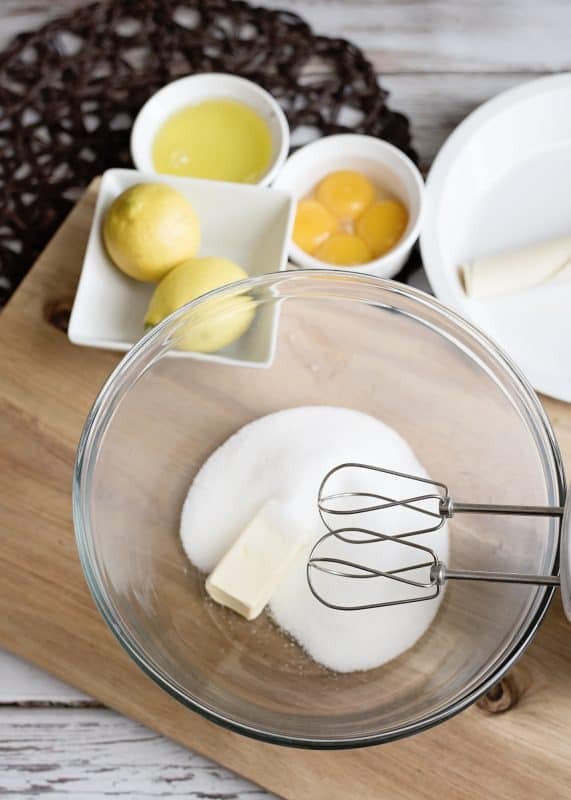 In a separate bowl, with clean beaters (important), beat egg whites until stiff and then lightly fold into your batter by hand using a spatula or large spoon (this means just stir them by hand until they are mixed in). The above photo shows stiff egg whites. After you fold egg whites into your batter, pour into pie shell and bake at 350 until set and golden, about twenty five to thirty minutes. It will be light and golden on top and smell like heavenly sunshine. For pretty sake, you can sprinkle a little confectioner’s sugar on top, if you like. Allow to completely cool before cutting. Even better if you make a day ahead of time and refrigerate until serving. Cream sugar with butter until light and fluffy. Beat in egg yolks. Add grated lemon rind and juice, beat in. 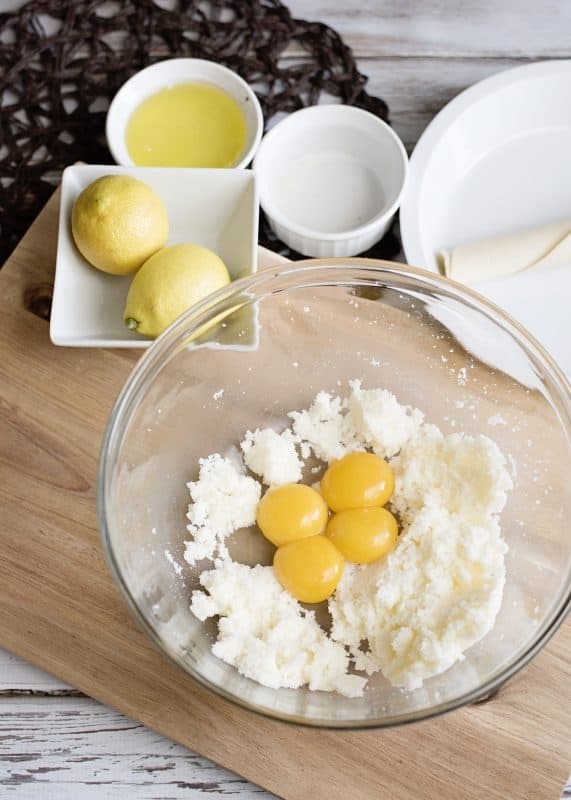 Beat egg whites in a separate bowl (with clean beaters) until stiff and lightly fold in. Pour into pie shell and bake at 350 until set and light, about twenty five to thirty minutes. Thanks for reading Southern Plate!!!! This recipe is featured as part of Meal Plan Monday and Weekend Potluck! I’m gonna eat a sliver of this tonight for y’all! And I’m going to eat 2 pieces of it tonight. Gotta get busy and get this thing cooking! I ate this every Sunday that we ate at the Toddler House 50 years ago with my daddy. Delicious memories. That looks awesome. I am going to give it a whirl as soon as I have some lemons in the house. Huh. Every chess pie recipe I’ve ever seen uses corn meal as the main ingredient. I was kind of expecting that. But I think this looks even better – it’s like a lemon meringue pie with the meringue as part of the filling instead of on top! Yum! My husband is gonna love this pie! I think lemon pie is my absolute favorite! My husband is a lot pickier (is that a word) than me. He only likes two kinds of pie…hot and cold! LOL! Of course, he might force himself to eat it lukewarm too. My sis and I shared a piece of lemon meringue pie for lunch today. Oh the taste in my mouth! I will have to try your ‘chess’ pie soon! Hey! Stephanie, I can get you a recipe that includes cornmeal if you like. Most chess pies do have some corn meal in them but my family prefers the smoother texture. The main thing about all chess pies is that they are pretty “eggy”. But yes, you’re absolutely right about the corn meal! We’re weird. Hey Linda! I love pies, too. My grandmother makes this amazing chocolate meringue pie that just tastes out of this world. I am going to have to post that one. Lemon meringue is my diehard personal favorite, followed by coconut and then this one. I got addicted to coconut pie from Lawler’s BBQ in Athens, Alabama when I was expecting my daughter! With my son, it was chicken noodle soup from Chick Fil A! Oh YUMMY! I will be giving this one a try! Your site is looking so good! I have turned your site on to many folks and they love it too! Keep the great recipes coming!!! Looks so very good! Love the Dora bowl! Being from Mississippi, this pie was a staple dessert. Oh so yummy! I haven’t made it in awhile. But when I do, I’m going to use YOUR crust recipe. I love chess pie! Do you have a recipe for chess cake bars (or squares as some people call them). A girl I worked with years ago used to make them and bring them to work. They were totally awesome!! I was going to say it reminded me of buttermilk pie. I love lemons and i love chess pie. So what a wonderful combination. yeah, girl! I do believe I grew up on these. We’d get little mini ones from the Dewey’s Bakery in town (the same place that makes Moravian Sugar Cake and Cookies). I never knew how to make them…until NOW! Thanks! Mmmmmmm! I am going to make this soon… looks just too good pass up 🙂 Thanks! Hey Treva! I’m taking care of posting about that thing, you know the really really neat and pretty thing, this week! Wednesday, to be exact!!! Thank you for being such a great encouragement to me!!! Leslie Oh girl, after spending that week in Orlando, every time I think about you I think of how hot you must be!!! Hehe, I got princess bowls, too! Donna Weeeeeee, you know how good it is, too! I just love simple things, don’t you? I don’t guess there is much that is simpler than a plain old chess pie, and not much that is better tasting, either! Let me know how you like the crust, I enjoy it and hope others do as well! Kingsqueen Buttermilk pie! I’m gonna make one of those eventually, too! You know its hard because I want to make so much, but there are only four people living in my house! I am taking the rest of the Lemon Chess Pie to my mother’s house today, I’ve had it in the fridge! You have the prettiest little picture for your avatar! Len I DO have a recipe for chess bars, or my grandmother does actually. I’m going to see her this afternoon so I’ll snag it for ya! Tina (Mommy’s Kitchen) You know, I’m a lemon dessert person, too. I guess its just something about the taste that makes things kind of sunshiney, you know? Nikki OOOOOOOOOh yes, I grew up on them, too! I love that we have so much of our food heritage in common!!!! I can just see myself sitting down to a meal of pintos and greens with you and both of us eating like it was dinner at the Ritz! Jo You have no idea how much I wish I could just pass you a slice right now! I love to feed people. It kind of feels rude sometimes when I post things and then can’t offer them to you all to taste! Deanna I am SO GLAD you said that because you know, I worry sometimes that my recipes might not be as southern as I think because – I’ve never lived outside of the south so I don’t know what else is out there!!!! I need y’all to let me know I’m on the right track!!! If I do post a non-southern recipe though, I can still claim it is southern because I AM a southern cook and my kitchen IS in the south so therefore whatever I cook in it IS southern food, right? Su I can see how you’d think that if you’d never seen one before, I imagine I’d think the same thing! What a cute cake in your pic!!! Thank y’all so much for reading yet another one of my posts!!!!!! This recipe was a big hit with my husband! I think I have found a use for all the Meyer lemons the bush in my backyard is producing right now! It was much easier than a standard lemon meringue since you don’t have to cook the filling before baking or make sure the meringue seals properly, and it tastes about the same. I reduced the recipe by 1/4 to make it fit into a store bought pie crust. And the tartness of the lemons covered up the chemically taste of the Splenda I used to make it lower in carbs. Thanks for the inspiration, Christy! I made this tonight for our weekly dessert, and even though I over-baked it(I totally forgot about it! ), it is DIVINE! We used your pie crust recipe as well, and I think we have a new family favorite. I can’t wait until I can eat it cold for my midnight snack! I mean,…..umm never mind. Thanks for the recipe! This sounds yummy and easier than a traditional lemon meringue pie, which I have never made (too afraid!). I don’t have any lemons right now, but do have bottled lemon juice. How much would you suggest using instead of fresh lemons? I’m gonna try this with the mix in the pan pie crust. Sounds too easy! Thanks for all the recipes, they sound great. I just found this site today and subscribed and received the ecookbook and am excited to try out some of the recipes in there also. I’m not “southern”, having been born in California and living in Oregon the last 15 years but all this food sounds so delicious. I’m a stay at home mom of 3 with #4 on the way and all these recipes are so simple and most ingredients I either already have, or are very easy and inexpensive to get. I’m sure my husband and kids will be forever grateful for all the yummy meals and snacks I’ll be making from your recipes! I just made this pie, and am waiting for it to cool down to take a bit. I used a pottery pie pan, and found the crust actually took about 16-17 minutes to brown nicely. But the baking went a few minutes too long for 25 minutes, as the top got a little dark. I will probably back it down to 22 minutes next time. I cheated and used my food processor to whip the egg whites, and they came out perfect. Woolworth’s in downtown West Palm Beach used to serve this at the luncheon counter in the 60s when I was a kid. Can’t wait to try it. Also, Christy, I ordered your cookbook. As I get older, I find I’m enjoying home cooking again, especially southern cooking. I want to make this pie to take to my parents on Easter. Do you have to use the zesting? I don’t have a zester and probably don’t have time to go get one before Sunday so how else could I do that? I grew up in a bi-cultural house Southern and Italian. 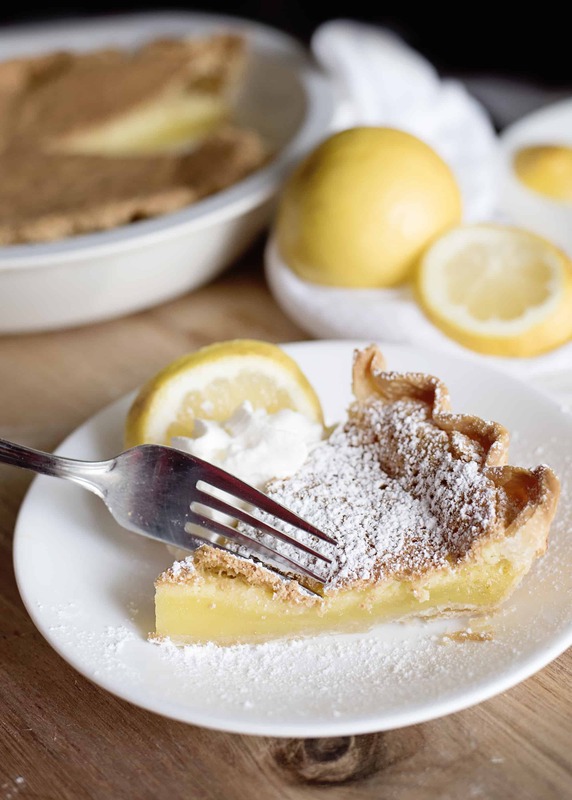 The Southern part brought us a love of pie and the Italian a love of lemons. We had chess pies but never lemon chess pies. 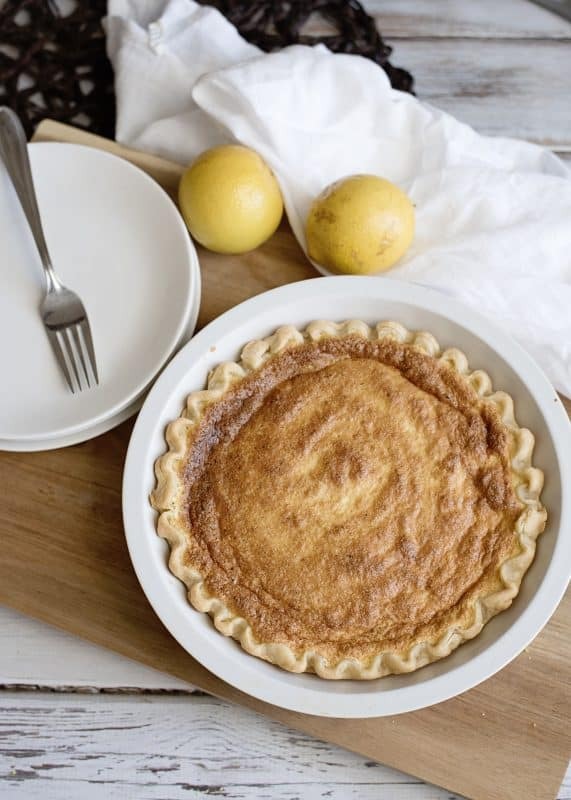 When I attended University in Lexington, Kentucky someone asked me to make a chess pie and I had lemons on hand so I decided to make a lemon chess pie not knowing the Southern cooks had already been making them. I served it to the folks that asked for the chess pie and they were blown away to get a lemon chess pie instead. They all knew of them but thought this Italian guy wouldn’t know how to make one. I actually didn’t know how to make one but I improvised. I didn’t make it with whipped egg whites but it came out very nice anyway. Since then I have made them often and will be making two of them today to serve with one of our Italian dishes. I love the food of the Southern cooks and often incorporate these dishes in meals with Italian food. Thanks for this entry. Via la the South. My mother’s birthday is the 21st and she just absolutely adores Lemon Chess and always complains that you can’t ever find it anywhere, anymore. Well guess what…Mom, Happy Birthday! I’ll be sure to make an after baking posting as well. Thanks for the great directions and the bang-on pictures. Wow, looks delicious! I like lemon meringue pie but it’s too much work and I would be the only one eating it (the rest of the family doesn’t share my love of citrus). Your recipe looks just right. Not a lot of ingredients and quick. I am going to have to make one real soon, even if I am the only one who eats it (I will just have to call my girlfriends over to share :D). BTW, if you get yourself a microplane zester, you can collect zest in no time, no more having to chop up the zest and they are inexpensive. Mine has a plastic sleeve on it so it fits in my utensil drawer without scrapping anything. Christy, my Papa (grandfather) is coming over for dinner tonight and I’m whipping this pie up right now to treat him for dessert! 🙂 Thanks for the great recipe! I baked this Lemon Chess for my boyfriend yesterday. He’d been begging for one for weeks. It was a total success. Thanks! Thank you so much for the great recipes. 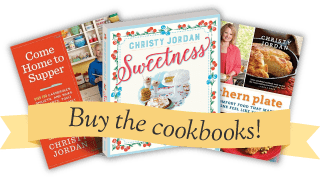 I found the link to your page from the SouthernSavers website, and I am loving finding recipes I had as a kid. Growing up in South Georgia these were all favorites, and since my Grandmother passed away while I was away at college, I was not able to get any of her recipes…Thanks again so much! I have made this pie and it has been in our family for years. now a tradition for us at Rosemary beach Florida with the slight change, I use Meyer lemons. The comments have always been positive and it would not be Thanksgiving without Lemon chess Pie. Thankyou to my Aunt Bettie for carrying this recipe forward.